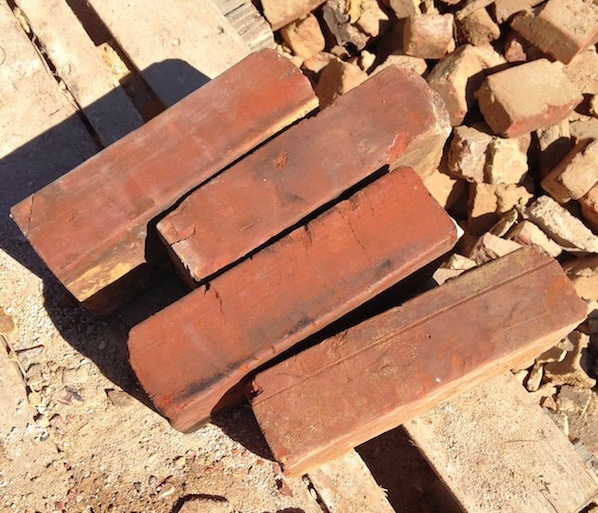 In Part 1 of Better Know A Brick (BKAB), we went over some basic brick terminology. Now that you can separate your stretchers from your headers and you’re comfortable that you’d never confuse a soldier with a sailor, let’s talk wythes and courses. The toughest part about wythes is settling on how the word is pronounced- some folks say the word so that it sounds like “width” which is essentially what it means. Other folks pronounce it with a hard “i” so it sounds like “Blythe”. Those truly in the know pronounce it somewhere in between so they can never be wrong. The photo below shows the back of one of our houses after we removed the rear wall. As you look at the party walls, you can see that they’re essentially two bricks wide- in brick speak, you’d say they’re two wythes thick. 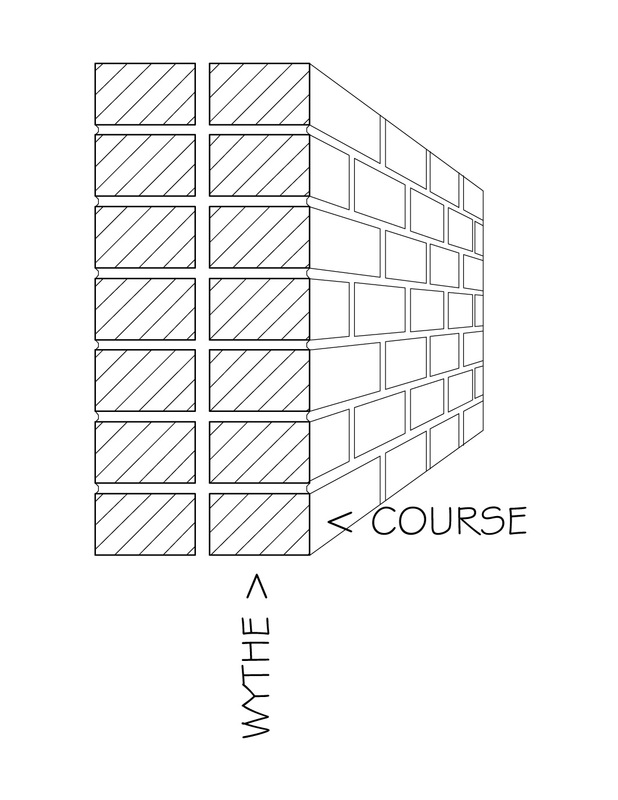 We already made a course pun (better than a coarse pun) in last week’s post about belt courses, so we’ll spare you here: a course of bricks is a horizontal layer one unit high. 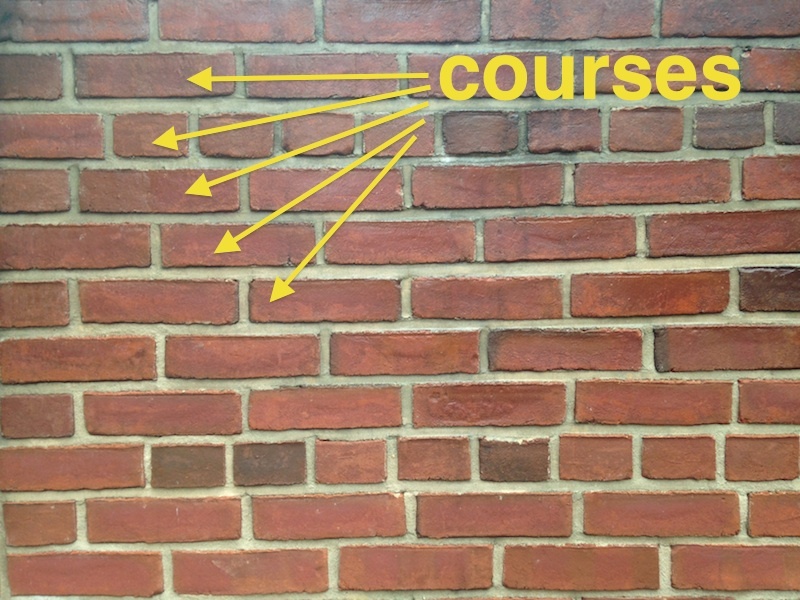 If you imagine yourself laying a brick wall, every time you make the wall one brick higher, you’re adding a course. Next up in BKAB: with courses and wythes sorted out, it’s time to talk about…Bonds. Brick Bonds. Two brick-lit posts in one week? What a gift! 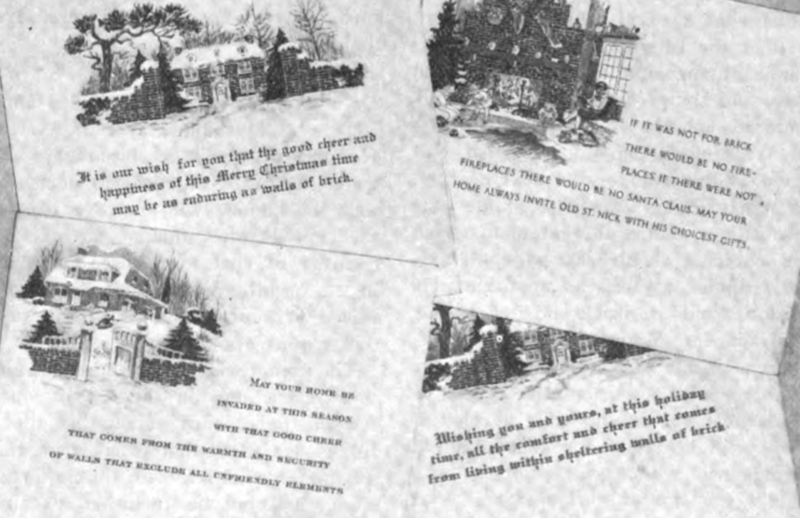 Here in Baltimore, the Champion Brick Company (a relatively small outfit on the East side of town) put out their own Christmas card in 1947. 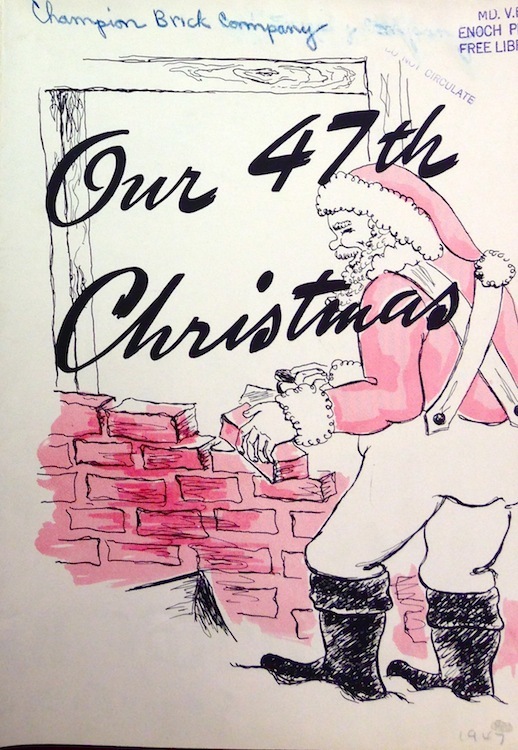 Happy Holidays from bricklaying Santa and all of us on Eager Street. 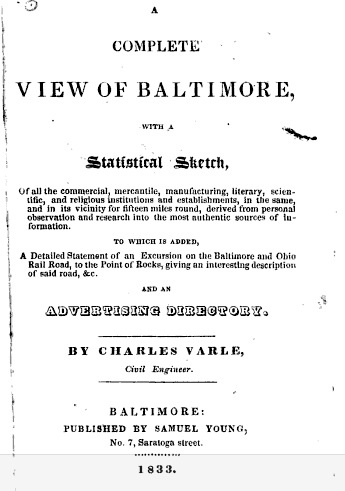 We’ve already had Charles Varle tout our bricks as being both bold and beautiful, but his rave came from 1833. 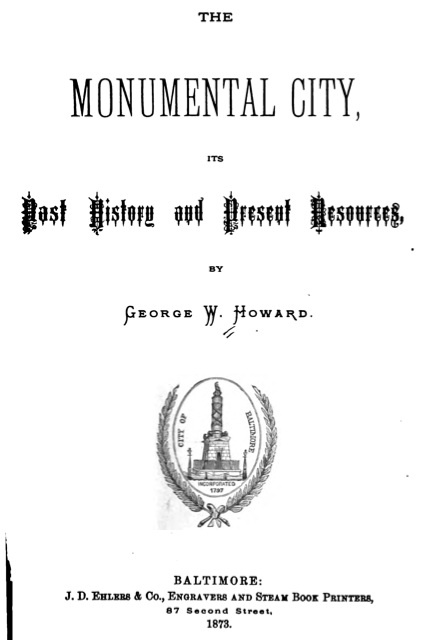 For a more recent review, we now turn to George Washington Howard, who wrote all about Baltimore bricks in his 1873 sketch of the city titled, “The Monumental City: Its Past History and Present Resources”. It’s true. 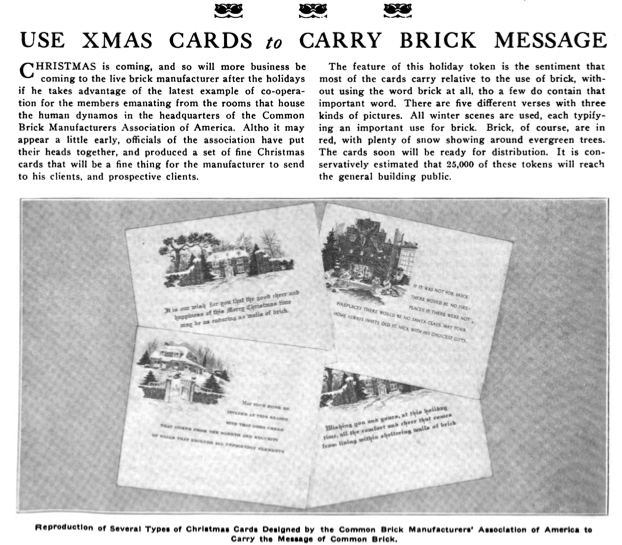 As early as the mid 19th century (when high transportation costs meant that brickmaking was largely a local enterprise), prized Baltimore bricks were shipped to Philadelphia, New York, and Boston. 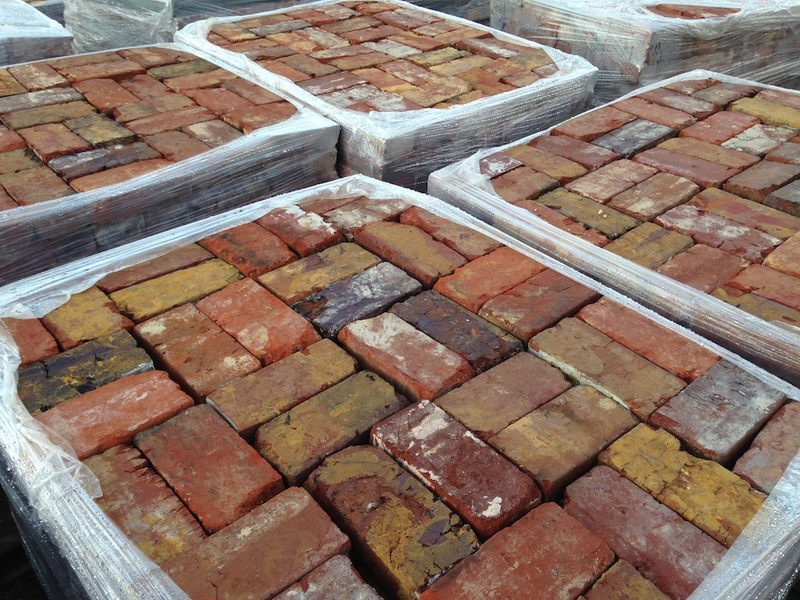 We’ve picked, cleaned, and palletized about 75,000 bricks so far, so we can assure you that our bricks are every bit as solid as GWH’s endorsement. 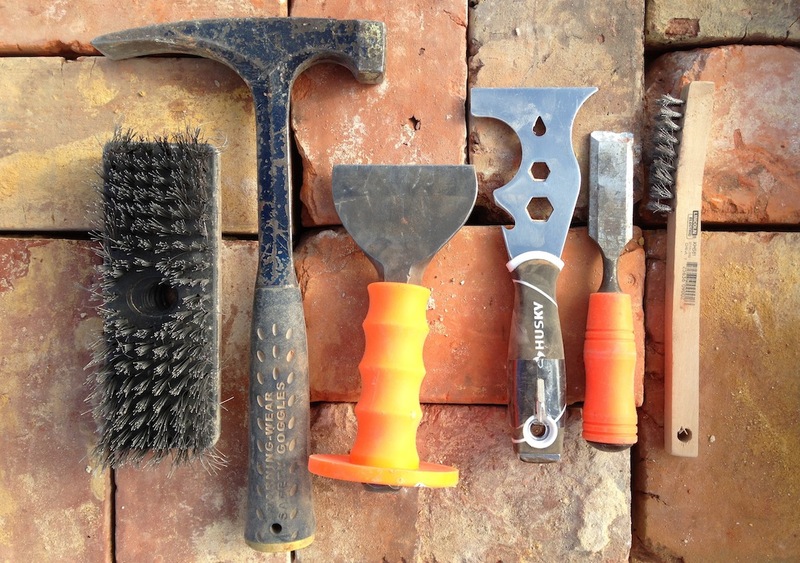 I wanted to start this post by saying that bricks get a bad rap, but that’s not entirely true. It’d be more accurate to say that bricks get no rap; they’re so ubiquitous that they’re hardly noticed. 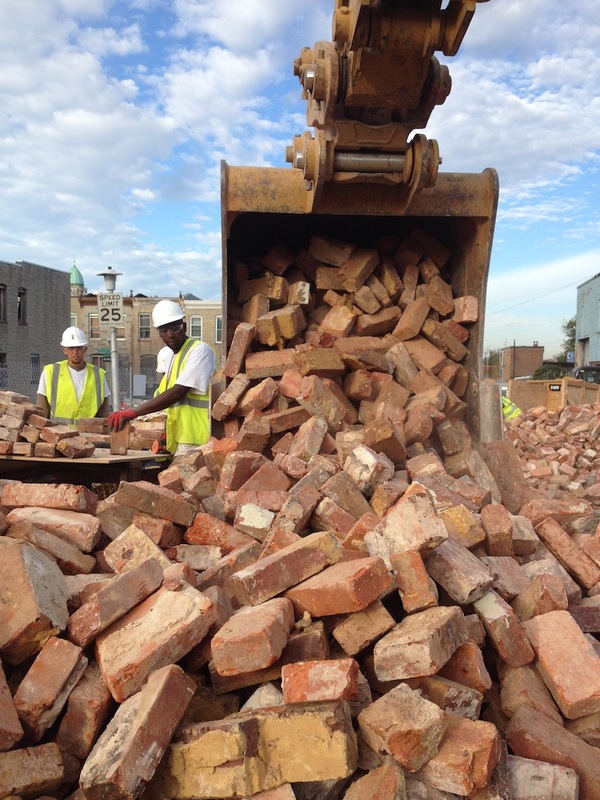 On Eager Street, we notice bricks- we’ve salvaged about 40,000 of them so far. 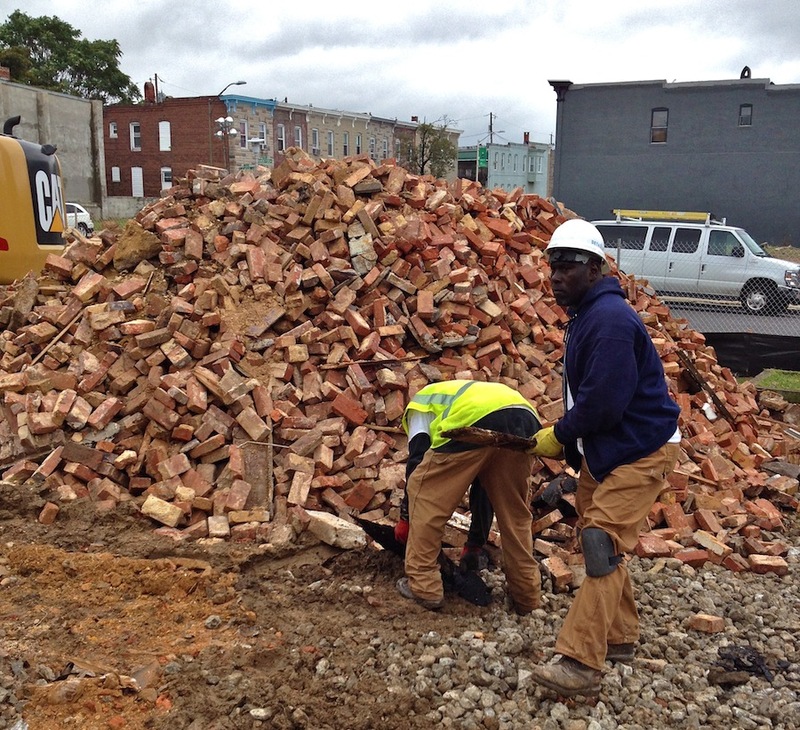 Every brick we handle was produced by the Baltimore Brick Company. A larger post dedicated to the BBC is forthcoming, but we thought we’d share this gem we found in the Vertical Files of the Enoch Pratt Library. 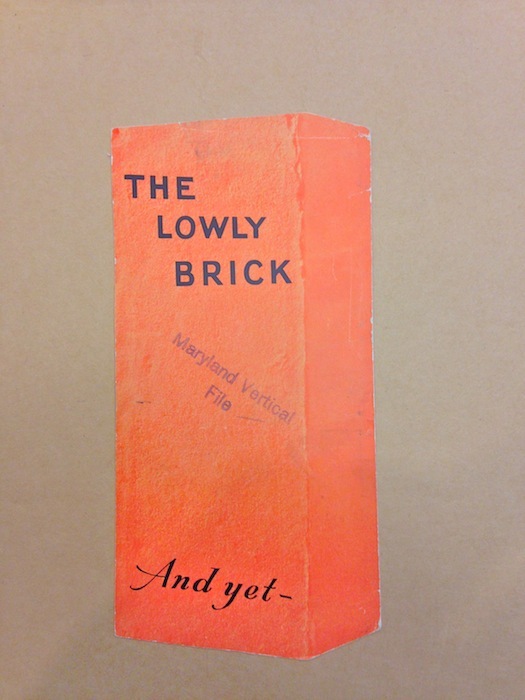 “The lowly brick. And yet…A mighty factor in the Progress of Baltimore.” We couldn’t have said it better ourselves. 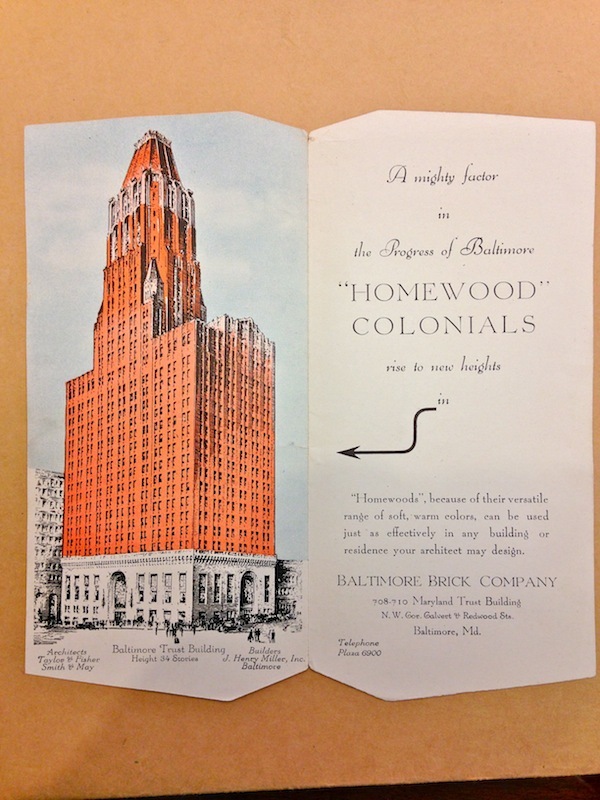 The building in the illustration is what we now call the Bank of America building, but it was called the Baltimore Trust Building when it was built in 1929. The words “built in 1929” usually spell trouble: the massive cost of construction (around $3 million) collided with the Great Depression, resulting in the eventual bankruptcy of the Baltimore Trust Company. The building was largely vacant within a year. 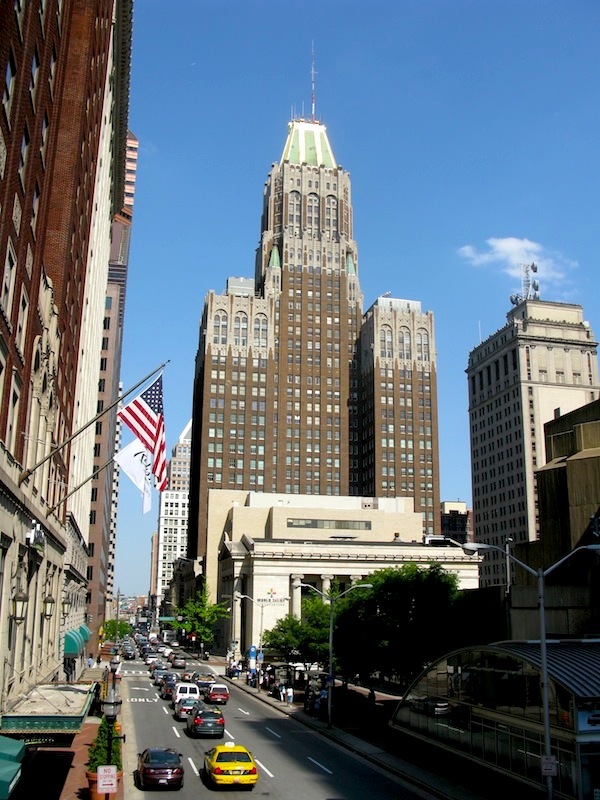 Eventually the building achieved steady occupancy and became the iconic member of the Baltimore skyline you see in the above photo. 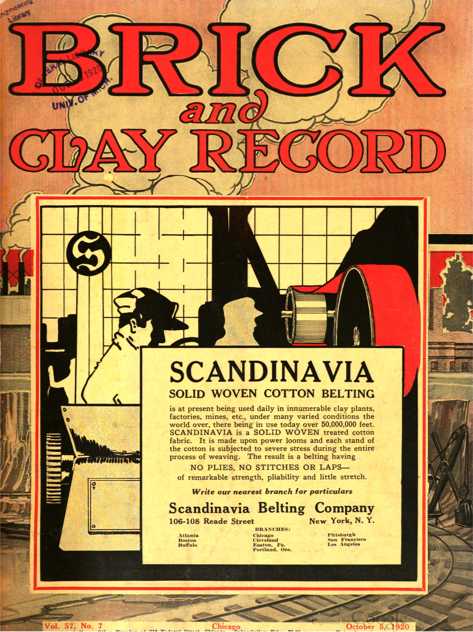 It also became a shining 34-story advertisement for the quality product of the Baltimore Brick Company, the same folks who made our bricks on Eager Street. Next up for the copper-peaked beaut: it’s being turned in 445 luxury apartments. Thanks, Mr. Varle! We couldn’t agree more. In this installation of BKAB, we’re going to talk about spalling. Appalled: a spalled wall. NOT from Eager Street! Water is an enemy of masonry, and this relentless and ubiquitous foe can can cause bricks to spall. 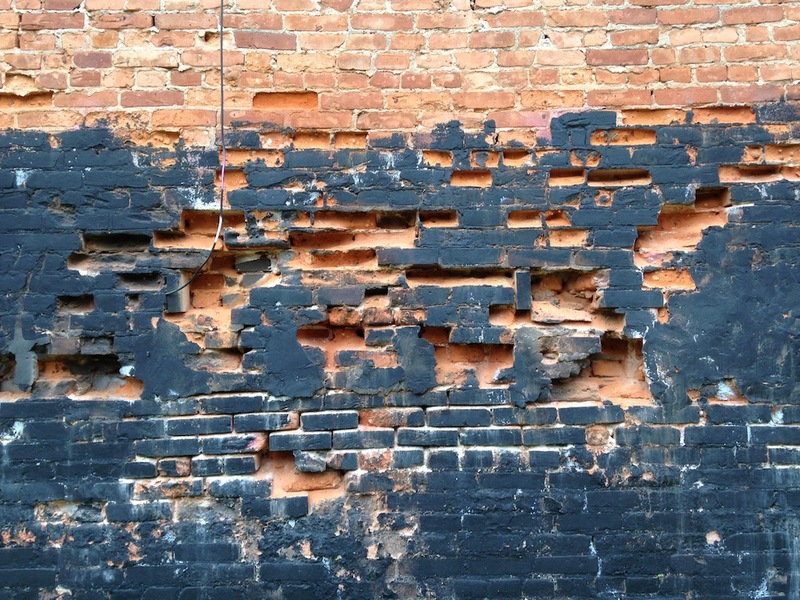 Spalling describes the gradual process of brick erosion stemming from moisture trapped and released during freeze/thaw cycles. This moisture can come from contact with the ground, or it can seep through overlaying layers of plaster, or it can be the result of direct contain with rain. When most people think of porosity, a brick is likely to be among the last things that come to mind, but bricks are indeed porous, with some bricks being much more so than others. 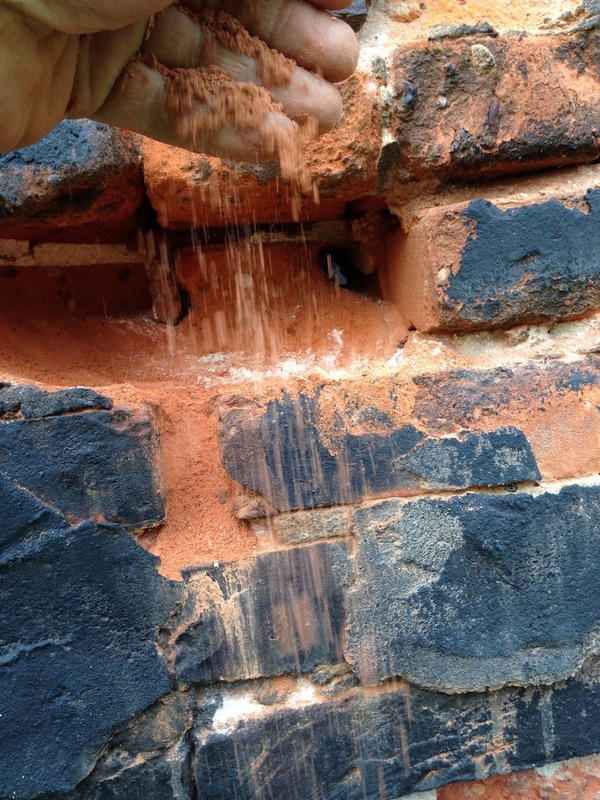 When the moisture absorbed by a brick freezes, it expands, creating slight fractures in the brick in the process. During a thaw, the moisture is released, along with the tiny flakes of brick created during the freeze. Not all bricks are created equal, however. 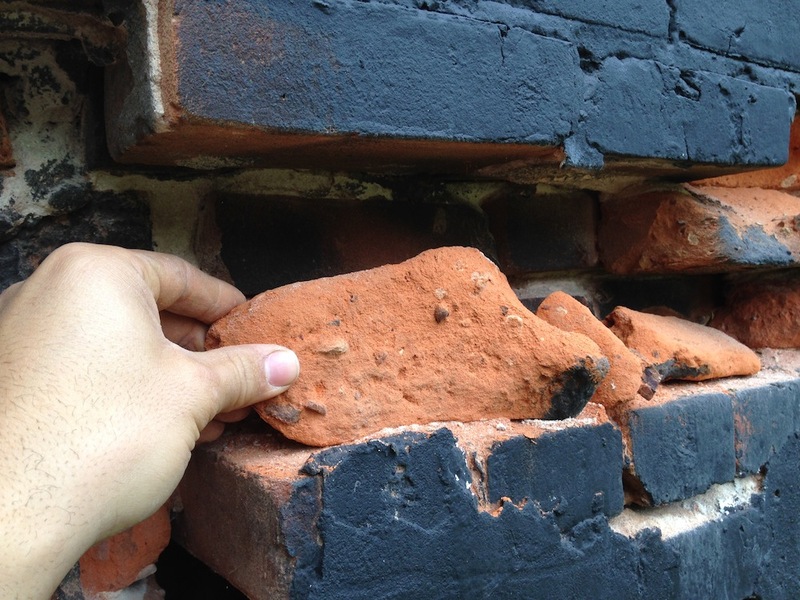 Bricks fired at higher temperatures for longer are generally less porous, so they are less susceptible to spalling. Take the bricks on Eager Street, for instance. The bricks we’ve harvested are not nearly as porous as many others, and for this reason we’ve seen practically no spalling. In fact, the foundations of the houses on Eager Street are made of brick, which some folks see as a no-no because contact with ground moisture could cause deterioration. But the foundation bricks of the Eager Street houses are super hard with very little porosity, fired high and long to that beautiful purple color you’ve seen in some of the photos. 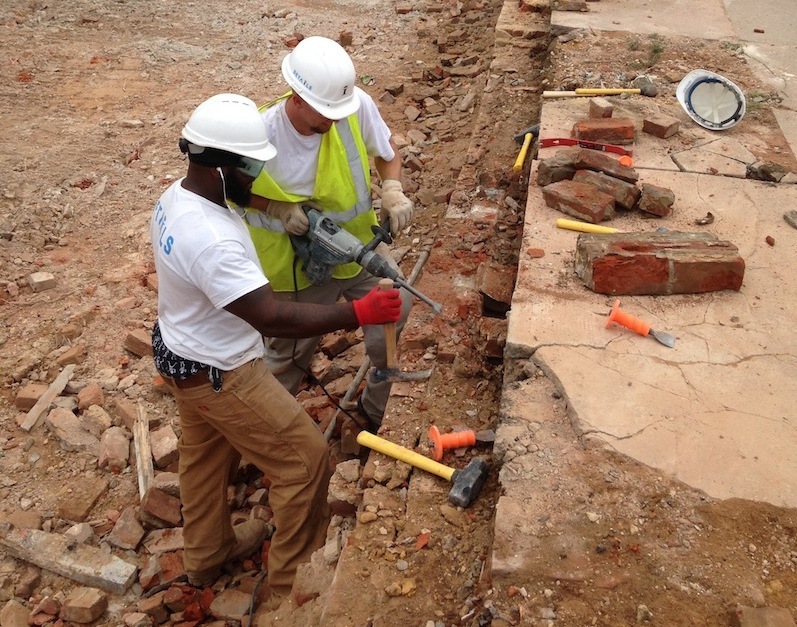 Josh and Dave chip away at a foundation wall to salvage brick. 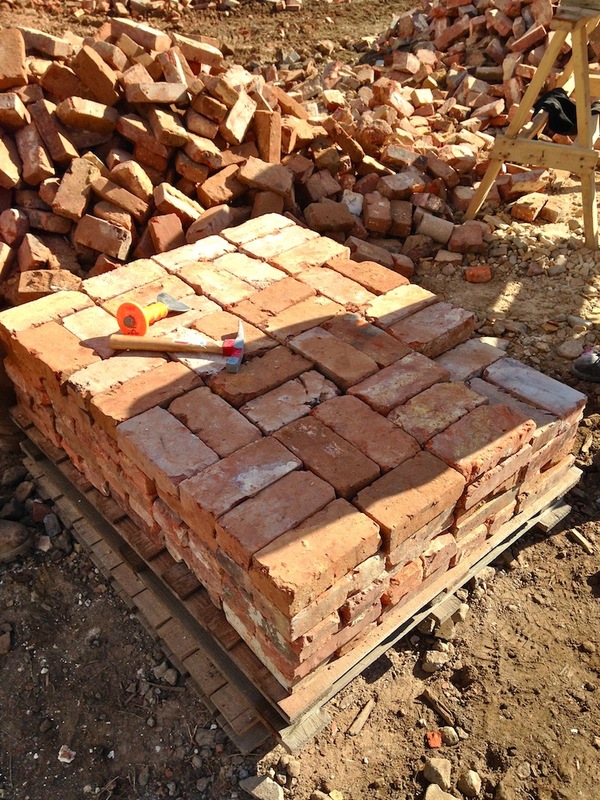 The foundations of our houses are made of hard, dense brick with low porosity. Powdery bricks called “salmon bricks” because of their telltale color were intended for interior wythes and were not designed to withstand the elements. But what happens when a rowhouse is demolished, leaving its neighbor with an exposed party wall that might be composed of weaker bricks? If left exposed to the elements, the bricks would likely crumble to dust. Such walls are generally plastered over with an impervious material, but cracks or leaks in this surface layer might actually create channels for moisture to seep in and become trapped! While salmon and water mix just fine, salmon brick and water don’t. See the photo below for proof. There’s more to a brick than, well, a brick. 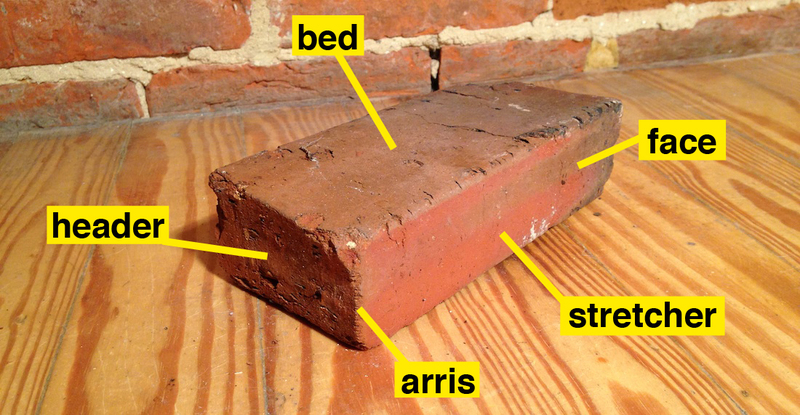 In this first installment of Better Know A Brick (BKAB), we’ll go over some brick lingo. 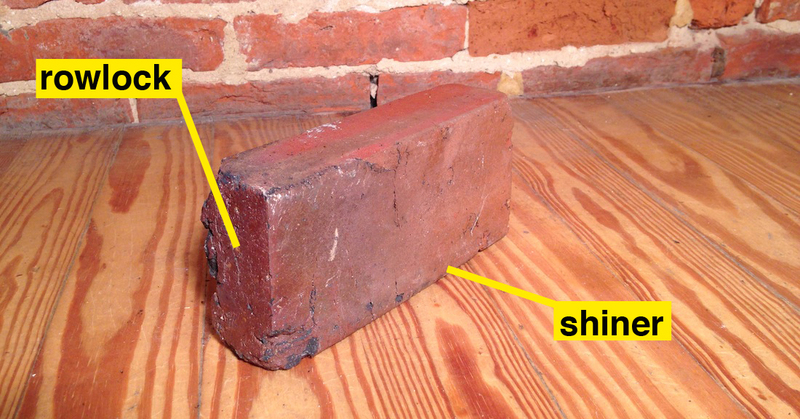 The photo below shows a brick as it is typically laid in a wall. The bed of the brick would receive the mortar. The face is what we call the part of the brick that remains exposed in a wall; when it’s the long narrow side, it’s called a stretcher. The shorter narrow part is called a header. The arris is simply the corner or edge formed by the intersection of two surfaces. Now it gets a bit tricky. Let’s say the brick was oriented as in the photo below, laid on its narrow long edge (what we’d usually call the face). A new orientation means new names: if the broad surface of the brick (the part we’d call the bed if it was laid flat) is showing, it’s called a shiner. Laid on edge rather than flat, the end of the brick is called a rowlock. 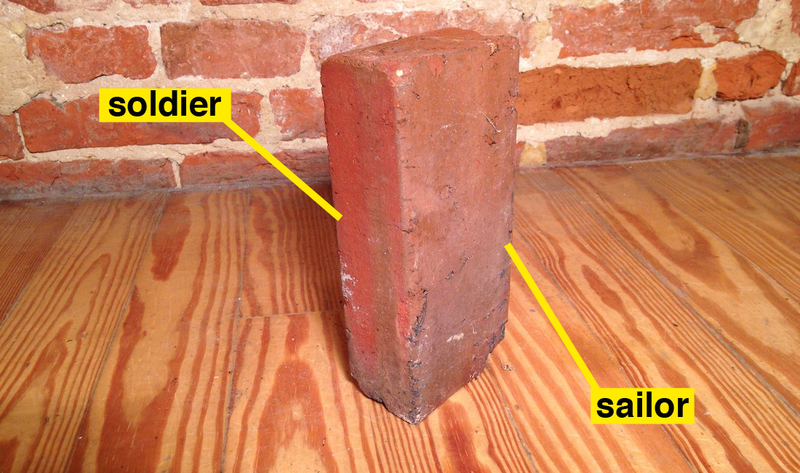 One final orientation: if the brick is laid on its end with the wide part exposed, it’s called a sailor, and if it’s laid on its end with the narrow edge exposed, it’s called a soldier. For next time: courses, wythes, and bonds!